When I think of Hungarian embroidery, I generally think of bright, multi-colored embroidery. From region to region in Hungary, though, different styles of embroidery dominate. Some of it is multi-colored and bright. Some of it is whitework. 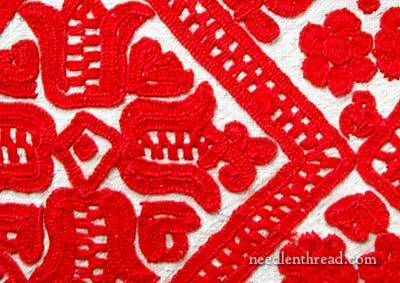 As with many countries that have a needlework heritage, there are many different styles of embroidery in Hungary. 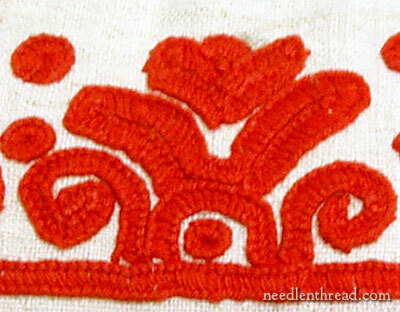 My favorite type of embroidery from Hungary is a kind of “peasant” embroidery, worked in red, red and blue, or red and black, on heavy, coarse linen. I’m calling it Hungarian redwork, because really, that’s what it is – it is often all-red embroidery, worked heavily in a combination of buttonhole stitch, a kind of closely worked open chain stitch, some satin stitch, and sometimes other stitches, too. The thread used is cotton, and the red – it’s really red! And maybe that’s why I like this embroidery. I’m kind of a sucker for red. It’s not just the red, though, that grabs me. I like the simplicity of this type of embroidery. It’s somewhat rustic and very folk-y. And I like that a lot. At the same time, it’s rather thick and heavy. And that might not go over so well with everyone, I suppose! So with today’s hand embroidery pattern, I’ve worked it so that you have two options – you can go with thicker, heavier lines, or with finer lines. Here is the design. You can click on it to see a larger version. It was drawn by Lilly Baróthi Zathureczky, and is part of “Lilly’s Legacy.” If you’d like to read the back story of Lilly’s Legacy, you’ll find it here, with the first Hungarian embroidery pattern in the series. 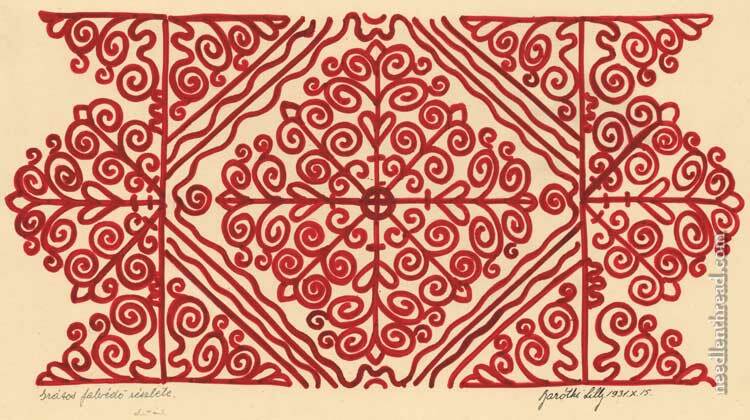 This particular “redwork” design is not quite the same as the folky designs you might see with this type of Hungarian embroidery. Normally, chickens, roosters, hearts, tulips and other flowers – typical “folk” elements in design – populate the redwork. Lilly’s design above is not as “folky” in this way, though you will see the heart motif subtly repeated here and there in the design. Instead, she relies on scrolly and wiggly lines for the majority of the design. I’ve re-drawn the design in a vector format, to make printing and transferring the design easier. Above is the heavier-lined version. If you want to go with heavy, wide lines to work the pattern in embroidery, you could trace the outside extremity of the heavy lines. This is the lighter-lined version of the design, in case you want to stitch it in finer line stitches. You may wish to enlarge or reduce the embroidery patterns as they are given in the PDF. If you choose “no scale” on your printer when you print the PDF, they should print at 10″ long. You can enlarge this easily by having it photocopied. For example, if you want the design 16″ long, take it to a copy center where they print on paper that size and have them enlarge the design for you. To reduce the design size, just change the scale or percentage in your print settings before you print the PDF. I’m going to use Hungarian braided chain stitch, Alba Maxima linen, and I haven’t decided on the thread yet. The outer edge all around will be hemstitched. My “vision” of the finished piece is as part of a Christmas centerpiece – the linen on the table, with the red embroidered ends sticking out below a Christmas centerpiece of some sort. The Hungarian braided chain stitch works up quickly, and the whole project can be worked “in hand” (without a hoop), making it a convenient project for working in casual situations. So that’s my plan – I’ll keep you posted! I have other projects going right now, we’ll see how well this one squeezes in. I hope you enjoy the embroidery pattern. If you’re looking for more hand embroidery patterns, there’s a whole collection of ’em right here on Needle ‘n Thread! May 14, 2011 Hungarian Embroidery Pattern #5: Makes a Great Pair. Will you show us your progress on your project as you stitch it? I miss following along with your projects and watching them grow. For instance seeing the medallion project progress a bit at a time was really fascinating–and I was always eager to see the next update. I love this! I’m a sucker for redwork. I usually have a piece of it going on at all times. It is so easy to pick up and put down. 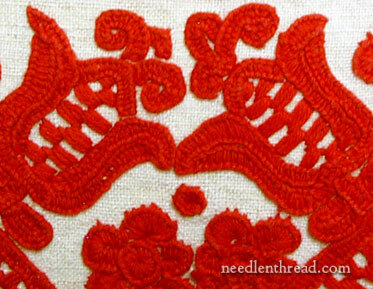 Plus I just love the color red, and find it striking to stitch it against a white or natural linen background. But this takes redwork to a whole new level. I never do redwork just in backstitch. Too boring. This though, what fun. I also love the red. It is NOT turkey red, much brighter. Thank you Mary, I see my next redwork project as I type. Hmmm… I see the central diamond-shaped element in white on red or white on green as a pretty Christmas ornament! There might even be enough time left for me to finish it before Christmas! Thanks for this lovely design, stitched in the red thread it’s so lovely and bright what a good idea as a centrepeace for a Christmas table just the right colour for the season. After I finished my current projects I want to try red, whitework and I’ve seen a design I like in Inspiration 74 magazine a drawn thread cushion so lots to think about. This is one stitch that really interests me, but i can not seem to execute it easily. In My favorite embroidery book – The Stitches of Creative Embroidery by Jacqueline Enthoven – she describes several ways to do the “large writing” stitch or closed or threaded square chain. I would love to see you do a video of that one sometime! Thank you, Mary. This is very pretty. I’m thinking of doing this as a blackwork design – in red. I also like the idea of a part of this as a holiday ornament. This is really beautiful and I look forward to following your progress. Today, I tried the Hungarian Braided Chain Stitch for the first time and I really love the texture and the look. My only question is how do you continue the stitch when you run out of thread? I had to stop midway and restart with a new thread and it looks like that is exactly what I did. There isn’t a continuous look to my braided chain. Hi, Tania – End the stitch where you end a chain, going down into the fabric in the same hole you came out of when you started the chain. The thread will be “woven” under the inside chain stitch, so it will hold from pulling through. Once you’ve ended the thread, start your new thread, coming up below your last stitch, just as you would when starting a new stitch, and continue the line. Thanks Mary. I’ll try this and let you know how it goes. Beaut pattern thank you. I like the way the end sections seem to cut off the central design while mirroring each other. It’s like lace sewn each side of a panel where part of the design has been sacrificed for the seam. Just how it would be in folksy economising for mending, extending or simply patch-working, with the desgn as intricate quilting. I really like it. Will love to see yours as it comes along. I was wondering though – I know you use inkscape to draw your vector line-drawings (thank you for offering these, by the way! ), I was just wondering though how long it takes you? Because I downloaded it and have played with it, and it literally takes me 2 hours to draw a circle… I was thinking if I attempted to do the line drawing you have provided today, it would take me at least a week of non-stop work (and probably much cussing!). Did you learn from any tutorials in particular? Because I’m really struggling with this technique! Glad to see another of Lilly’s designs. This particular style of embroidery comes from the Torockó area in what is now Romania (look for Rimetea or Kalotaszeg on a map). Examples I have are worked on a round thread 36 to the inch fabric with an unusual mat cotton – the closest thing we can get is DMC Coton Retors Mat #4 worked with one ply of five removed. Hedgehog Handworks can get it for you – she’s getting me some black to work another type of embroidery from the southwest part of Hungary. The Hungarian manufacturer of thread suddenly stopped making the stuff and everyone is scrambling to find a substitute. The Christmas runner sounds very pretty – I hope you will show us pictures when it is done (I can send you the traditional Hungarian edge if you would like). Hi Mary, thank you so much for all the help and inspiration you give on your site. I am taking an embroidery/ design course in the UK. We are going to produce a piece of work in the style of Rebecca Crompton (these will be exhibited along with some of Rebecca Crompton’s work in Derby), though we don’t yet know the final details for our pieces. There is a stitch on the ‘Adam and Eve’ piece that my friend and I cannot identify. If I send you a couple of photos, would you look at them and see if you can make out what the stitch might be? Thanks again. Marilyn. I love redwork!!!!! and your patterns are awesome!! I´m so glad you share them with us. Thanks a lot!!!!! The first 2 pictures are so called “Irasos” embroidery, and from Kalotaszeg, now part of Romania (an area of about 34 former Hungarian villages, now with mixed population). A different variation of this type of embroidery is from Szekelyland, a different part of Transylvania. as you can see from the 2 images, the stiches are the same category, but the end result is slightly different. The traditional colors are red, blue and white, the fabric were usually a hand woven hemp and cotton blend. Beautiful embroidery is usually seen in churches in these areas. A collection of Hungarian motifs is available here: http://yourlz.com/p2 used both for painting furniture and embroidery. There are other types of Hungarian embroidery, like Kalocsai, Matyó, Palóc, and those are more colorful. This website is a fantastic resource! I learned basic embroidery as a child with my grandma and I tried to do a couple projects recently. I needed a refresher and stumbled upon this website and the wonderful tutorials on the stitches. I was wondering if on projects like this if you could post a picture of the finished project? I would love to see what this would look like finished. With internet at hand, t’s not that difficult to know that tis embroidery is called Kalotaszegi varrottas or Kalotaszegi embroidery. If you google it you can find a lot more about it. Thank you for the free pattern and so many wonderful tips on stitching. I am using two of these small pattern to make needle books as gifts. One for my daughter who is now stitching, also for my sister in law. Thanks again for the great site and all you give. God bless. Previous Previous post: Looking for Free Blackwork Embroidery Patterns?